A succinct summary, but – sadly – a spot-on piece of pithy criticism. The opening half of The First Avenger is a demonstration of why superhero origin stories are so popular while its closing hour demonstrates the clichéd trappings of such stories and the tendency for bloat that defines so many modern superhero movies. Let’s start with the good stuff. The First Avenger places the charismatic Chris Evans at its centre; his casting is easily the best decision the filmmakers made. Evans was one of the few actually fantastic things about Fox’s frightful Fantastic Four franchise. While the gallant Steve Rogers couldn’t be more different to his firebrand role in that film, Evans is perfect in the role. Yes, he’s virtuous and absurdly patriotic – as the role dictates – but he’s also likeable, funny and a joy to watch, even when reduced by computer animation to a weedy weakling. Sorry, I was supposed to be talking about the good stuff. And there is a lot of it here; the origin story gives us time to get some insight into the fibre of Rogers’ character and his close bond with his best friend ‘Bucky’ (Sebastian Stan). It’s well-paced; we never feel like we’re rushing past necessary character development points but nor is there that “when are they getting to the fireworks factory?” anxiety. There kind of is a fireworks factory, actually. 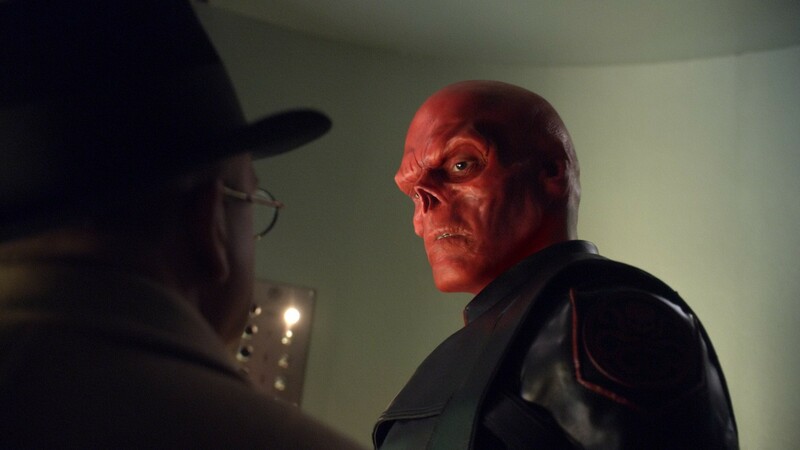 A weapons-manufacturing plant houses our supervillain, “Hydra” head honcho Johann Schmidt (Hugo Weaving, gleefully chewing the scenery) – aka “Red Skull” – who’s a thinly disguised analogue of Hitler, except with super-soldier abilities and Tesseract-powered glowing guns straight out of Doom (the game, not the movie). Those glowing guns illustrate the film’s aesthetic: equal parts ‘40s nostalgia and videogame maximalism. We don’t want an actual war film after all, a film where the audience needs to temper their enjoyment of the action scenes with a realisation that millions of people died in World War II, so death rays are a good way to take a significant step away from reality. Those action scenes – at least in the first half – are pretty magnificent. 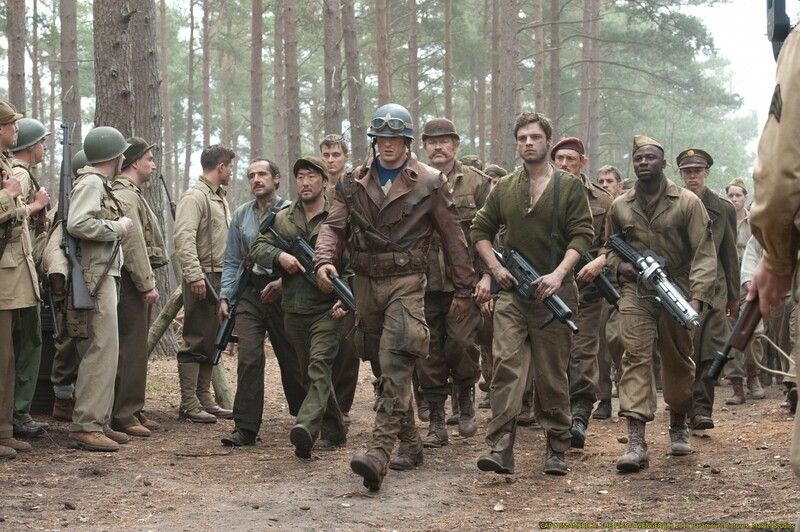 A chase scene through the streets of ‘40s Manhattan is a showcase for both the setting and Steve’s new powers as Captain America. It also brings Hydra to the attention of the American army, who respond by sending Cap out to promote the sale of war bonds, a wonderful mid-film pivot that plays with audience expectations of what a superhero film “should” be. Soon enough, though, we’re back into the action: after Bucky is captured by Hydra forces, Rogers singlehandedly saves the day. He rescues a horde of Allied soldiers, destroys the Hydra headquarters, confronts Red Skull – it’s a great way to end the film. Except that this isn’t the finale. It does mark the point where Captain America: The First Avenger slides into disappointing dullness, abandoning the tightness of its origin story arc for a swollen last half that ticks off all the narrative necessities to accommodate The Avengers but fails to command audience attention. The flaws of the last half stem from the film’s structure. Up until now, we have a neat, engaging three act structure on our hands, with the first act establishing Rogers and his world, and the second act beginning with conflict introduced by the Hydra spy sabotaging the super-soldier program. It’s decidedly conventional but that’s hardly a problem in a Captain America movie. What is a problem is that instead of ramping up to a big finale after the factory confrontation, screenwriters Christopher Markus and Stephen McFeely snap us back into Act One. We discover that Hydra has countless manufacturing plants dotted around Europe which the Allies – and Captain America, natch – will have to dismantle in order to stop their nefarious plans. On paper it might make sense as a shift into Act Three, but instead we’re treated to montage after montage of action sequences without any sense of weight to them. All the momentum drains out of the film as we wait for some actual characted-centred conflict to arise. It doesn’t help that this is all executed with perfunctory necessity. We have to explain where Captain America got his shield, and conclude Bucky’s arc, and somehow get him into the twenty-first century, and so we do, running through a checklist with all the enthusiasm of a house inspection. The videogame aesthetic and visual design of the film – immaculate up until this stage – is stretched to breaking point. An action sequence on a train looks embarrassingly dated. You get the sense that the special effects guys and the editor have given up: an airport hangar action sequence looks worse than any of the scenes that preceded it. A Tarzan moment where Cap swings from a chain is so clumsily edited that I’m theorising it was filmed in post-production purely to insert into the trailer. When we finally soar into the sky for a confrontation between Red Skull and Captain America on an aircraft laden with death, the film regains its bearings. Suddenly the exaggerated romanticism returns, and the film’s themes dovetail into an action-packed fight. The emotional weight of the conclusion should be sapped by The First Avenger’s alacrity to promote The Avengers and yet I found it remarkably moving. We know that Captain America will live to fight another day, but there is a sense of severance and loss here that isn’t sullied by the blatant cross-promotion that concludes the picture. 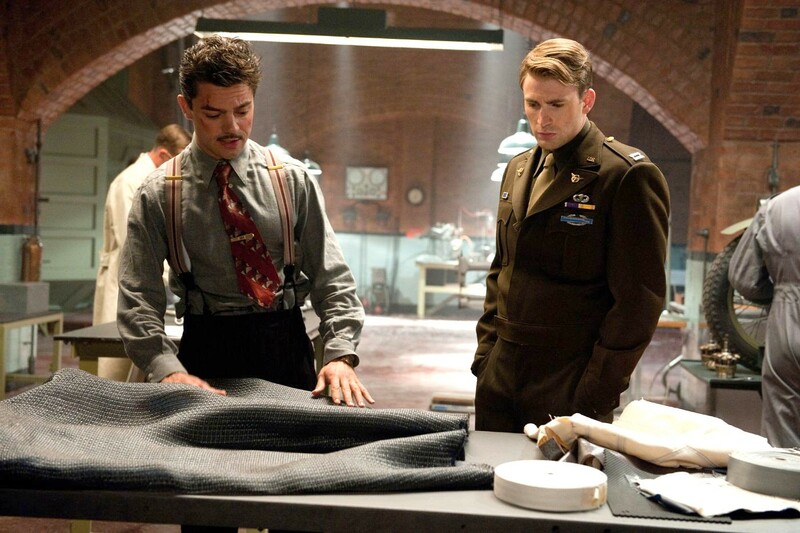 The First Avenger would have benefited from a tighter, neater narrative. If I had to guess, I’d say the problems of the last half can be placed squarely on Marvel’s doorstep; the director and writers’ confidence when establishing Steve Rogers and his world suggest that they were simply strongarmed into including all the necessary bits-and-pieces: for comic book fans and for the franchise at large. Perhaps these missteps can be forgiven, then, if they were necessary to produce a film as fun as The Avengers. Here’s hoping that The Winter Soldier isn’t as constrained by the requirements of its franchise. Great review, Dave. Very well argued. I have to say: in the three times I’ve watched this I have never once felt the second half lacking in comparison to the first. I think Captain America the best of Marvel’s origin stories, by a wide margin. The montages even worked for me, because it helped establish the tightness of Rogers’ team, which amped the emotion when said team faced threats. I definitely don’t think this is a bad film, but I really feel like there’s a forty minute chunk there that I was just completely disengaged; it just tried to do too much in too little time and lost me (for example, I had no interest in “Rogers’ team” because they weren’t really characters, just archetypes). I went into this film with very low expectations–just didn’t think it would work for whatever reason–but I was surprised when I actually enjoyed it. As far as origin films go, I don’t think it’s better than Iron Man, but it’s still a fair amount of fun. I have pretty high expectations for Winter Soldier. Here’s hoping it delivers! Nice review! I enjoyed it too! I probably spent more time talking about what I didn’t like than what I did, but it wasn’t a bad film at all – probably on par with Iron Man 3 which I also liked despite its flaws. I’m pretty keen for Winter Soldier as well, seeing it on Friday! JEALOUS. I’ll have to wait another two weeks from then. Enjoy though! I couldn’t agree more on this review. It’s the weakest of The Avengers franchise. Hopefully it can do a Thor and give us an improved part 2. Thanks! I don’t agree it’s the weakest – I’d rank this over Iron Man 2 and Hulk at least – and around the same as a few others, but I’m definitely hoping for a big improvement from the sequel. Fingers crossed! To be fair I didn’t see Hulk but I did quite like Iron Man 2… lol! Good review. Sort of the same old thing we’ve seen Marvel do many times before, but hey, it still works. So there’s no real problem with that, is there? It’s just that it feels fresh in the first half! I guess so much of my disappointment with that forty minutes or so in the second half was the way it just felt like any other superhero movie. Great review Dave. This is one of my favourite of the Marvel films. I think I gave them a bit of leeway on the things it did wrong, just because I loved the somewhat bold decision to make this a period piece. Loved that idea. Yeah I would have loved to see a second period set film as well. Will be interested to see if I find the character as interesting in The Winter Soldier when the film does not have that going for it.